I grew up In Portsmouth in the 1950’s. In those days on each of the four corners of the street square was a shop – usually a family grocer. There you could buy everything you needed to live a respectable English life. Tea, butter, sliced bread from the “aerated” bread company (ABC), marmite, cabbage, smoked bacon bones, salmon and shrimp paste, black jacks, bangers, sprouts, sandwich spread, Bird’s custard, Daddy’s sauce, fruit salads, suet, malt vinegar, syrup of figs, salad cream, lard and so on. Rationing was only slowly slackening its grip upon our throats. Although the corner shops were all groceries, they were nevertheless all different because they were all family businesses, each one with its unique profile for stocking, pricing and for customer service. The nearest thing to a supermarket was Marshall’s, where my mum worked. Sugar and flour were served in a cone of brown paper, orders were delivered by a boy on a bike with a basket on the front. Every Xmas a free tin of biscuits was delivered to each regular customer with a note thanking them for their patronage during the past year. The American Empire changed all that. Modest grocery shop windows gave way to gaudy red and orange plastic frontages, to “Malls” and hypermarkets. The age of the bland ubiquitous “global” store had arrived. Private landlords and public councils saw the chance to impose swingeing business rates on small family enterprises and put them out of business. Only the moneyed classes retained their “boutique” butchers and “traditional”speciality traders. Today no Brit standing in a pseudo-American shopping Mall could tell if they were in Portsmouth, Birmingham or Aberdeen. And that’s what I like about Velez Malaga and its surrounding villages. American shopping culture – if culture is the right word – has entirely passed it by. In the villages it’s easy to walk through a fly curtain and find you are not in the supermarket but in someone’s front room so modest is the frontage of the shop. It’s the same in Velez. You need to know where the shop is, because if you don’t it is not going to shout at you. And why should a shop blare out its presence? Everyone in their own communities knows where the butcher the baker and the candlestick maker are. After all, shops are for those who live around them not for tourists or passers by. Velez itself is a glorious tumble of small family enterprises, each with its own character and unique quality. I am not being sentimental about this, it’s genuinely a relief to be able to choose what you buy instead of having the choice made for you by some remote marketing manager. 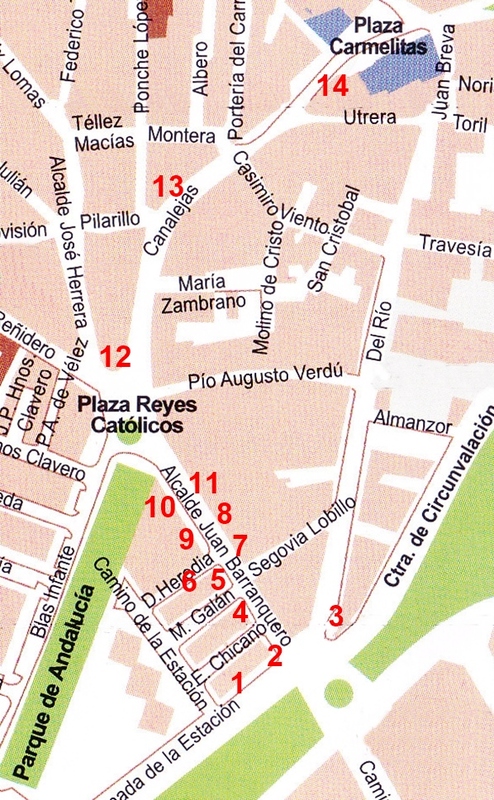 This is a description is of just one little nondescript street leading from the Plaza Reys Catholicos that I hope will demonstrate the texture and richness of the shopping experience here. The street I’ve chosen is called Alcade Juan Barranquero and is best approached from the south. You park in or near The Mercado de Mayorista (the big wholesale market) and walk up the Explanada dela Estacion (see the bottom left hand corner of the map). 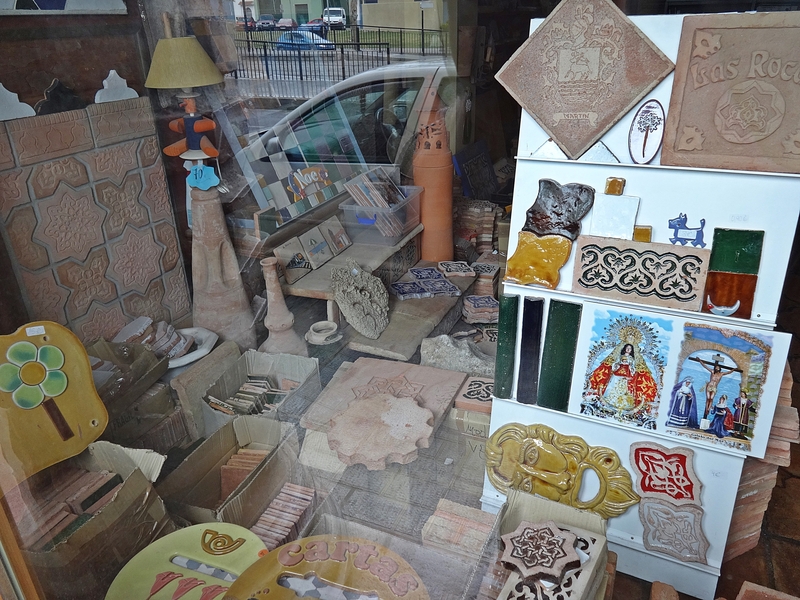 You soon come to shop number 1, which is the rustic tile shop called “Rusticos Chamorro”. 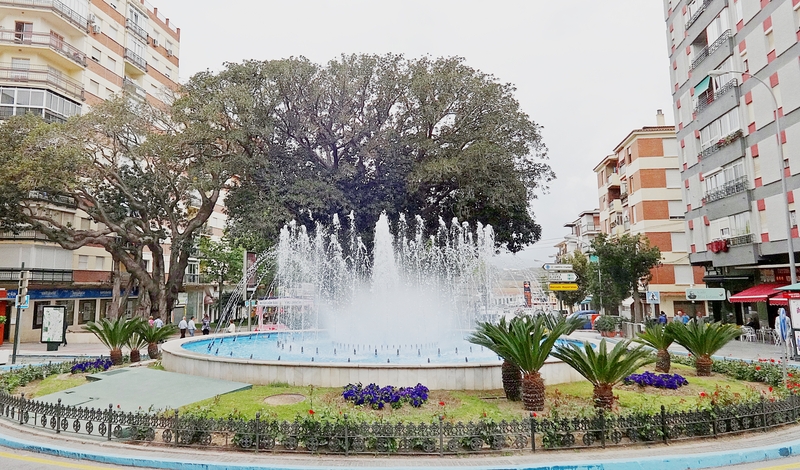 It is a little family outlet for the typical “ladrillos” of the Axarquia. These range from the thick red “Barros” – typical floor tiles and bricks that are made locally and fired by the sun and in wood fired furnaces, to delicate hand painted tiles and Moroccan patterned tiles available plain, etched or painted. Many of the smaller, highly decorative objects sold here make nice presents. They are more original and better value than many market stall outlets and very much reflect the taste and interests of the people who run the business. Walk to the corner to shop no 2. 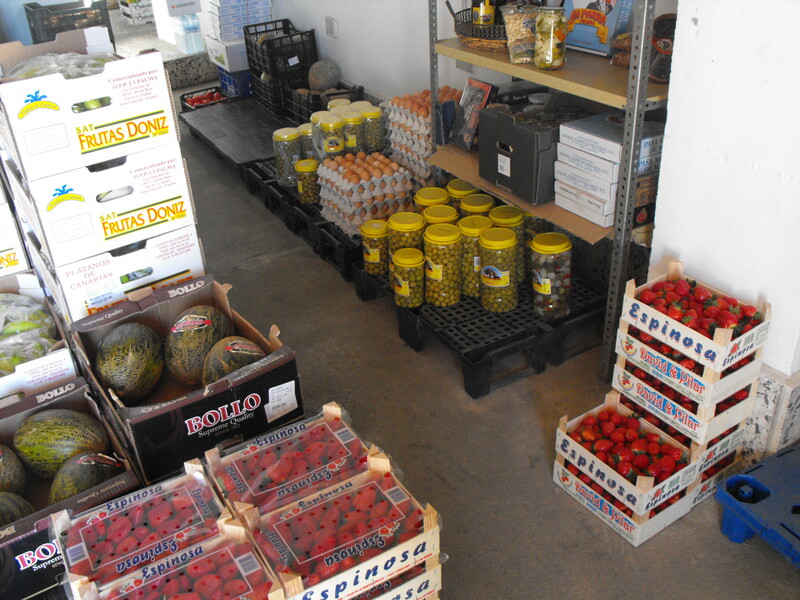 This shop belongs to José Berenguer Vigo who buys fruit and veg from Mercado de Mayorista (wholesale) down the road and retails it to the public by the box load. Today strawberries and oranges top the bill but there are always sacks of spuds, big jars of verdiales oil and split green olives, fig bread, dried figs and raisins. This is a good shop to use if you are planning a party and need to make the occasional bulk buy. He is more expensive than the market but in my opinion better value. This is the point about small shopkeepers. They have unique skills learned from teachers in their family and we the customers benefit from that experience, particularly the skill to source the best local products and offer it at the best price. Before turning left into Alcade Juan Barranquero, look across the street to shop number 3. It has an open front and is a wine bodega called Bodegas Magnums. It is quite small but offers a large number of regional and local wines. The typical wine produced in the villages is sherry like and sweet because of the warm local climate. However, the new wines of Almachar created by George Ordonez are rapidly becoming world renowned. He uses grapes from local growers in Almáchar on slopes too steep for any kind of mechanisation, which is farmed by hand and without irrigation in the traditional style of the Axarquia. The grape is the muscatel de Alejandria, from old, free-standing vines in slate and limestone soils. Many vines are between 80 and 100 years old. The muscatel grapes are picked in several stages for maximum ripeness. The resulting must is fermented in French oak and the fermentation is stopped by chilling. This is what produces a dry fresh table wine. Magnams stocks white, red and rose by Ordonez at about €13 a bottle. Reassuringly expensive, but you know you’re worth it! Turning left into our street, we immediately come to the very flash shop no4 Bar El Rubio (Blondie’s Bar). It has a clean steel feel and a friendly engaged staff. Personally I don’t think much of their menu del dia, but they serve excellent fish and seafood, and are a good bet for a tubo y tapa. Leaving that clean steely feel and moving on towards the Plaza, we realise with a shock we’ve gone from the sublime to the ‘cor blimey, with shop no 5 El reclamo, which is a great big old-fashioned pet shop of the sort that would be immediately closed down in the UK or anywhere in the north of the northern hemisphere. It has absolutely no redeeming features whatsoever and nothing you’d want to buy unless you eat millet. It sells canaries in tiny cages, dogs, chickens, ferrets, hamsters, partridges, quail, mice and cats all piled up on each other in cramped and barely sanitary conditions. It also offers haircuts for dogs and vetinary advice. I only include it because a) it is a genuine family business b) it reminds me of the 1950’s when I used to go to pet shops and buy great crested newts, slow worms and greek tortoises from a load packed into a crate like meat pies c) Because in the very middle of the pet shop street front is what I suppose is a sub let – what we used to call a “wet” fish shop called Pescados Pericos selling fresh fish. Not on Sundays of course and not on Mondays because there is no fishing on Sunday. Supermarkets by contrast don’t care how old their fish is nor were it comes from and sell whatever isn’t rotten six days a week. 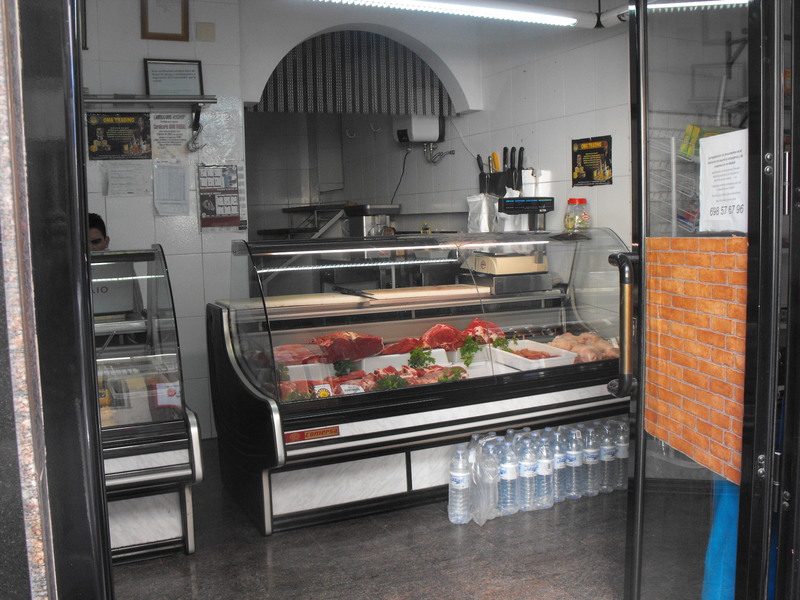 Round the corner from El relamo is shop no 6 the Hal Hal butchers. This is also family. They have another branch on Torre del Mar. I use them for beef sausages, which frankly could do with a bit of pork fat in them, costilla de ternera, which my son, the celebrated London chef Stan Perry describes as “short ribs” – wonderful cooked slow in Rioja. Also rosewater and orange water, essential with mint and dates for cold orange salad, and salted black olives, a nice change from the split green ones that are local. Opposite El reclamo is shop no 7, my favourite vegetable shop ever, the Fruteria Vita. It’s a family business where mother and daughter work in the shop and brother is the buyer. Most of the produce comes from Algorrobo where the alluvial coastal soil produces top quality vegetables and salads. They source as far north as Zaffaraya and their main stock is strictly seasonal – strawberries now, cherries soon, then plums, peaches, mangoes in August with table and muscat grapes, then tangerines and a succession of citrus. They also sell “Cateto” (country) bread with a crunchy crust and heavy crumb and a range of (imported) dates, also confections of nuts. Sugared almonds are my favourite. As you can see from the photo, they also offer quality salt cod. Next to the Fruteria Vita is shop no 8 Bazar Chino – a truly grand family enterprise. I am assuming that everyone who works in the shop is from the same family, but what do I know? Last year I was accosted by a sophisticated Chinese female employee with impeccable English who explained the rudiments of LED lighting to me. I bought several bulbs, but unfortunately they were crap. All the little internal lights went out one by one. I should have gone to Leroy Merlin’s and paid 5€ a bulb. Nerertheless this is my absolutely favourite Chinese Barato (cheap shop). Jude and I buy all our cazuelas there and our son, the celebrated London chef Stan Perry took home bags of little tapas dishes last time he came out. Cazuelas are glazed red clay cookware. In the UK, in Heals a standard dish would set you back £15. Here they cost pennies. Also, if you want to go fishing, say, from the rocks around Nerja, you can set yourself up with rod, reel, line, keep net and lures for about €30. Across the road is shop no 9 the Bar Capri, great for a pretentious del dia at only €8. Posh people from Nerja won’t understand, but up here in the hills, if we get a fillet of Dorada on the Del dia menu we think it’s Xmas. Next to the Capri is shop no 10 a little butchers that specialises in fresh meat pattis, meatballs and burghers. 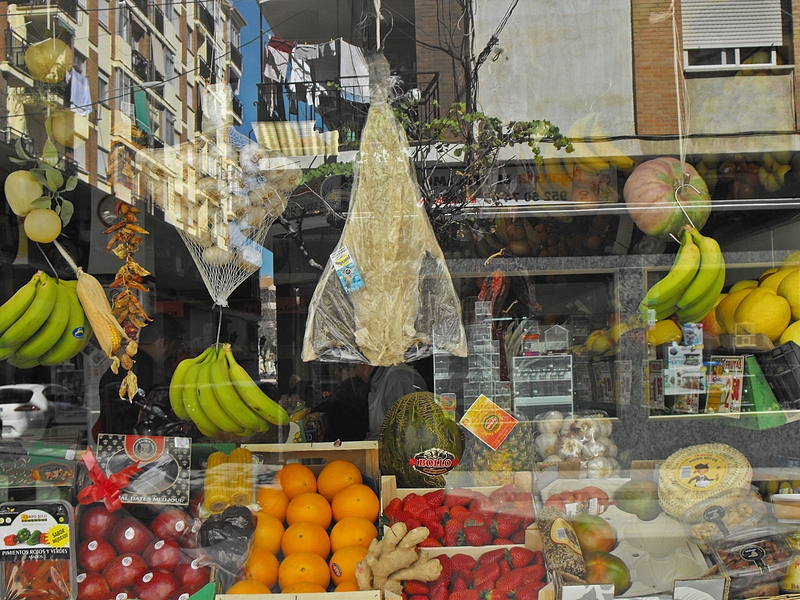 Next to Bazar Chino is shop 11 – a little Mercadona supermarket. I mention it only because the intrepid can park underneath and can get free parking if they buy anything. We recommend torrefacto coffee and white wine. Since you have now arrived here at the fountain, three more shops come to mind. Look through the fountain and you can see shop no 12 Bar Niza, which opens at 6am so that other shop keepers, who open at 10, can have breakfast. And what breakfasts! A full Spanish, English, French or Norwegian is to be had. Churros and chocolate is available all day seven days per week and an a array of disturbing Spanish cake confections – whipped whale fat and sugar, glare at you through the cold counter. Niza has the air of faded, very faded Europe. What Donald Rumsfeld used to call “Old Europe”. Waiters in bow ties and faintly stained whites combine attention with contempt. pouring boiling milk into your cafe con leche until slightly after you screamed STOP! Judy and I hold it in great affection and always go there for a breakfast, or lunch or a teatime treat. Shop no 13 the Albardoneria (which means the saddle makers) involves a two minute walk up the hill towards the town hall. It should convince you that you really don’t need to go to Malaga to buy leather. The front is all shoes, there are cabinets of leather cases and covers, a shelf of leather hats and at the back beautifully crafted stuff for horses and donkeys. It’s here I buy my Camper shoes for €30 because they have a continual sale of branded footwear. For shop no 14 walk another fifty metres up the hill to find on your right the Charcuteria La Dehesa that sells fine jamon, cheese, a range of quality charcuterie and wine. Friendly expert staff are pleased to let you taste whatever you want. This is a mere sketch of the variety and quality of produce and expertise available in little more than eighty metres of provincial side street, but what cultural richness! The shopping environment is not slick nor is it full of overt of subliminal instructions to buy. In fact it is quite a scruffy little area – not historic or special and yielding nothing to the needs of tourists or to the American delusion that to be “happy” you have to be constantly buying stuff you may or may not want. You have to do a bit of work to find what you need but it makes the shopping experience uniquely rewarding and very human. Get it now while you can. The slightest rise in prosperity will send the rent and rates through the roof, drive out the little people and let in the international chain shops and global thugs. Then Velez will be indistinguishable from Croyden. Velez Malaga is a great town for shopping. It’s a real “locals” place, isn’t it? Of course, I know many of the ones you’ve mentioned, but it’s always good to find out a few more to try. Like you, I love the personal nature of the shopping – much like it was in the north-west of England when I was a little girl. I wonder why the staff are like that in Bar Niza? We’ve been going in there occasionally for 10 years – and still get treated with contempt!! 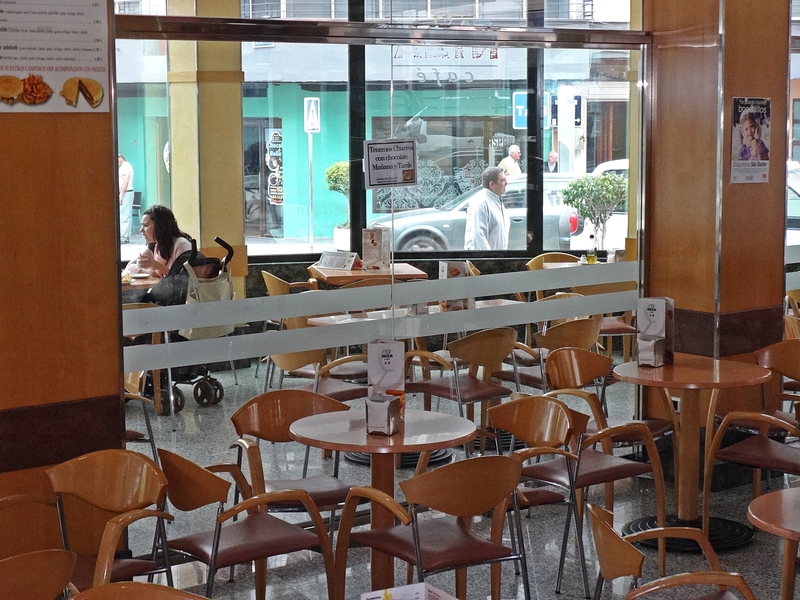 The two “sister” bars in Torre del Mar have MUCH friendlier staff (Las Yucas and Cafe Bar Centro – both on Avenida Andalucia). Im looking for annywhere in Malaga province to buy hatching eggs from chicken and birds ?